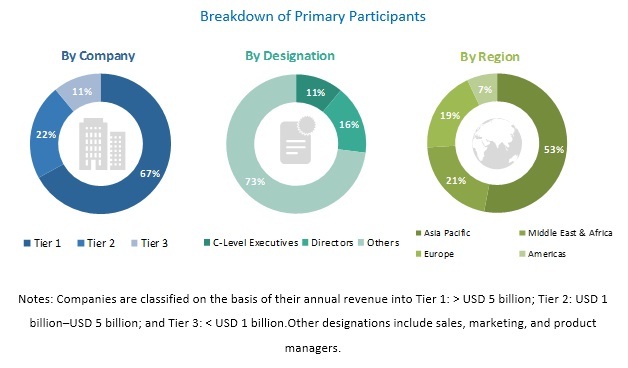 [127 Pages Report] The pipe insulation market is projected to grow from USD 8.7 billion in 2018 to USD 10.3 billion by 2023, at a CAGR of 3.4% during the forecast period. Pipe insulation is a material or combination of materials that add a protective covering to pipes and reduces the heat loss or heat gain from surfaces operating at temperatures above or below the surrounding temperature. The growing production of oil in countries such as the US, Saudi Arabia, Iran, and Russia drives the demand for pipe insulation. Also, the presence of stringent regulations to insulate pipelines drive the demand for pipe insulation. Rockwool material type to lead the pipe insulation material market during the forecast period. The pipe insulation market has been segmented on the basis of material type into rockwool, PU & PIR foam, fiberglass, elastomeric foam, and others. The rockwool material type is expected to lead the market during the forecast period, in terms of value. Its non-flammable nature and high compressive strength drive its demand in various applications. Additionally, it is sustainable and does not cause any harm to the environment. The industrial application segment is expected to be the largest contributor to the overall pipe insulation market during the forecast period. Based on application, the pipe insulation market has been segmented into industrial, oil, district energy systems, building & construction, and others. The industrial segment accounted for the largest market share, in terms of value, followed by the oil segment, in 2017. Rapid industrialization in regions such as APAC and South America and the necessity to insulate pipelines used in various process industries are expected to drive the market in the industrial segment during the forecast period. 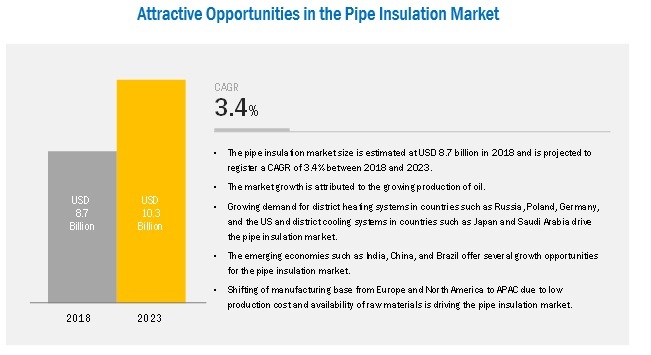 APAC is expected to account for the largest share of the pipe insulation market during the forecast period. APAC is estimated to be the largest pipe insulation market in 2018 and is expected to continue to lead the market till 2023 owing to the growing industries in the region’s emerging economies, such China and India. Rising per capita disposable income, rapid urbanization, and growing demand for district energy systems are projected to fuel the growth of the pipe insulation market. Additionally, high growth in various industries such as pharmaceuticals, food processing, and chemicals are expected to drive the demand for pipe insulation in the region. The key players in this market are Rockwool International A/S (Denmark), Owens Corning (US), Saint-Gobain (France), Kingspan Group (Republic of Ireland), Armacell International S.A. (Germany), Huntsman Corporation (US), Johns Manville (US), Knauf Insulation (US), BASF SE (Germany), and Covestro AG (Germany). In October 2018, Saint-Gobain acquired 100% equity shares of Kaimann GmbH International, which is one of Europe’s leading manufacturers of elastomeric insulation products. In November 2016, Rockwool acquired Flumroc AG (Switzerland), a stone wool producer. This acquisition is expected to help the company to expand in the pipe insulation market. In April 2017, Owens Corning introduced the first and only formaldehyde-free Thermafiber light-density mineral wool insulation. In May 2018, Huntsman announced that it plans to build a new Polyurethanes Systems House in Dubai. Polyurethanes are used to make pipe insulation products. This expansion is expected to help the company strengthen its market position in the Middle East. What are the major developments impacting the market? What is the upcoming type of pipe insulation? What are the emerging applications for pipe insulation? What are the major factors impacting market growth during the forecast period? The study involves four major activities to estimate the size of the pipe insulation market. Exhaustive secondary research was done to collect information on the market, the peer market, and the parent market. The next step was to validate these findings, assumptions, and sizing with industry experts across the value chain through primary research. Both top-down and bottom-up approaches were employed to estimate the complete market size. After that, the market breakdown and data triangulation procedures were used to estimate the market size of the segments and subsegments. Secondary sources used in this study are annual reports, press releases, and investor presentations of companies; white papers; certified publications; articles from recognized authors; and gold standard & silver standard websites such as Factiva, ICIS, Bloomberg, International District Energy Association (IDEA), International Energy Association (IEA), Insulation Manufacturers Association (IMA), North American Insulation Manufacturers Association (NAIMA), European Federation of Association of Insulation Contractors, and Thermal Insulation Manufacturers and Suppliers Association (TIMSA). Findings of this study were verified through primary research by conducting extensive interviews with key officials such as CEOs, vice presidents, directors, and other executives. The pipe insulation market comprises several stakeholders such as raw material suppliers, end-product manufacturers, and regulatory organizations in the supply chain. The demand side of this market is characterized by the development of the oil, industrial, district energy systems, and building & construction applications. The supply side is characterized by advancements in technology and diverse application industries. Various primary sources from both supply and demand sides of the market were interviewed to obtain qualitative and quantitative information. The key players in the industry were identified through extensive secondary research. After arriving at the overall market size-using the estimation process explained above-the market was split into several segments and subsegments. In order to complete the overall market engineering process and arrive at the exact statistics of each market segment and subsegment, the data triangulation and market breakdown procedures were employed, wherever applicable. The data was triangulated by studying various factors and trends from both demand and supply sides in the oil, industrial, district energy systems, and building & construction applications. Rockwool International A/S (Denmark), Owens Corning (US), Saint-Gobain (France), Kingspan Group (Republic of Ireland), Armacell International S.A. (Germany), Huntsman Corporation (US), Johns Manville (US), Knauf Insulation (US), BASF SE (Germany), and Covestro AG (Germany) among other players. The report categorizes the global pipe insulation market based on material type, application, and region.